For all of the time that you spend finding the perfect hunting rifle, you need to spend just as much time choosing the right ammunition. And with all of the rifle ammo options available today, it can be easy to forget just how hard developing a rifle bullet actually can be. Think about all of the attributes shooters are looking for: it has to be aerodynamic so it flies where you want it to, and it has to be strong enough to penetrate through everything from rough hides to flesh and bone. And after all that, it needs to reliably expand at just the right moment. And the manufacturer has to design a line of bullets that can do all of this, every time, with every shot. It truly is no simple undertaking. All of this should lead you to one simple conclusion: the best bullets will lead to the best hunting experiences. So, educate yourself and choose your ammunition wisely, and see what a difference the right ammo choice can make. At Grab A Gun, we have a wide selection of rifle ammunition from a variety of respected manufacturers, including Winchester, Remington, Hornady, and Federal. We have hundreds of options including every caliber imaginable. You can narrow down your selection not only by manufacturer and/or caliber, but also by price, action type, barrel length or capacity. The end result is a smooth, stress-free ordering process that gets you the ammo you need at a price you can afford. So before your next hunting trip, take a trip over to GrabAGun.com. 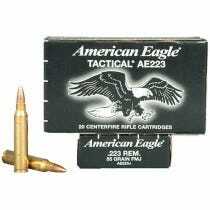 We have the ammo you need for the hunting rifle you love. Let Grab A Gun show you how having the right ammunition can make all the difference.